The five elements were pre-cast in a dry dock which was created north of the river. The pumps begin flooding the dry dock. The pump's advanced sound attenuation was also important to ensure a minimum of noise pollution during the operation. Cranes lower pumps into the dry dock. Flooding was accomplished with the help of the fleet of SPP Autoprime diesel driven pumps, ranging in size from 4 in to 8 in. As part of the second phase of the Irish M7 motorway development, the impressive new four-lane Limerick Southern ring road runs through a tunnel beneath the River Shannon, a short distance before the river flows into the Atlantic Ocean. To assist in the construction of the tunnel, which at a cost of €500 million, is one of the largest projects undertaken in the western region of Ireland, the project called on SPP Pumps. 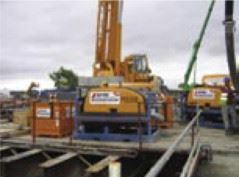 A total of 18-20 Q Type SPP Autoprime pumpsets were provided on hire from MW Hire of Urlingford, County Kilkenny. Although not unique, the tunnel design is certainly at the cutting edge – the centre section comprises a massive immersed tube measuring 675 m in length and consisting of five pre-cast elements each measuring approximately 100 m long, 8.5 m high and wide enough for two lanes of traffic in each direction with emergency walkways on each side. The five elements were pre-cast in a dry dock which was created north of the river. This casting basin was then flooded and the elements, each weighing in at 20,000 tonnes, were floated out and sunk into a pre-dredged channel across the river. The five immersed tube tunnel elements were then connected and the river bed was reinstated above the tunnel. This stage of the construction was particularly difficult due to the fiercely tidal nature of the river. The floating and sinking procedures were accomplished by means of a hoisting system used in conjunction with eight ballast tanks sited inside the tunnel tubes. A hydraulic line and pumping system controlled the amount of water within the tanks to provide the lateral trim required during transportation and the lowering process. Flooding of the dry dock was accomplished with the help of the fleet of SPP Autoprime diesel driven pumps, ranging in size from 4 in to 8 in. 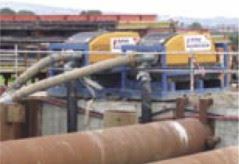 The pumps' sound attenuation was also important to ensure a minimum of noise pollution during the operation. 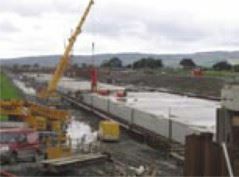 Construction of the Limerick Tunnel began in August 2006 and completion is expected in September 2010.